And now for the quarterly (??) installment of, How Does Sarah Beth Have So Many Clothes?? Guys, I give away stuff all the time, but it just comes back to me. And, every time I start to think I’m being excessively materialistic, some amazing deals fall right into my lap, and I can’t help but think maybe it’s okay for me to have a lot of these unnecessary pretty things that make me happy. Who knows. Regardless, here are my latest finds. First, I was at the mall recently for a legitimate purpose that had nothing to do with Charming Charlie. But, since I was walking past, anyway… I decided to stop in and just see if anything was on sale. Lo and behold, not only was there a ton on sale, but their clearance was buy one, get one free! 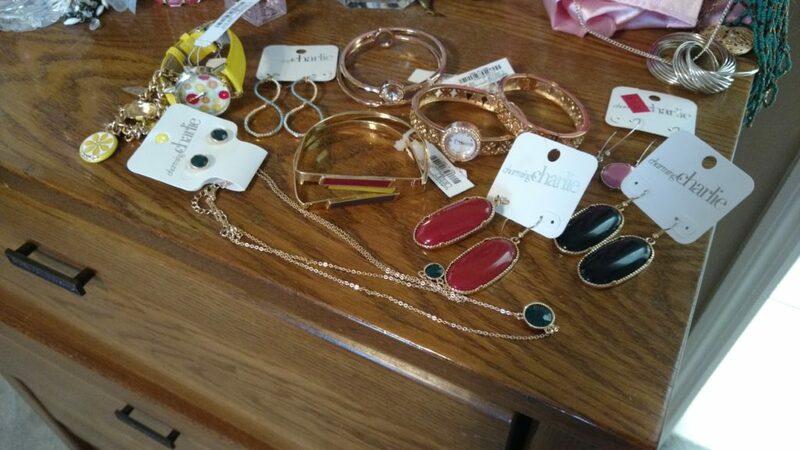 So, for $40, I came away with two watches, two bangle sets, a bracelet, a necklace/earring set, and four pairs of earrings. That’s 10 pieces of jewelry for $40. Of course it’s cheap and trendy, but for $4/piece, it’s okay if I only wear it a season or two. And I had just been saying the day before that I’d like to refresh my jewelry collection a little bit – ask, and you shall receive! In haul #2, I happened upon a yard sale the other day while running my errands. Let me first say that I really don’t like yard sales – they overwhelm me and make me feel awkward. Also, I think on the way there a 10 year old might have flipped me off for not stopping at his lemonade stand. You may notice there is no furniture in this picture… But, this lady was getting rid of some never-worn clothing and shoes (seriously, the tags are still on some of the pieces) – in my size! 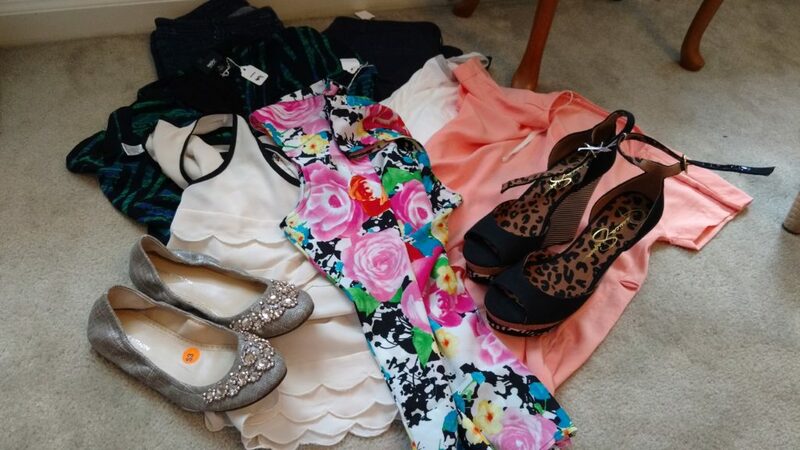 I got these Jessica Simpson wedges, Adrienne Vittadini shoes, two pairs of jeans, shorts, and 5 tops – all for $25. They were asking $26, but I’m a shrewd negotiator. So, these are the things that happen to me. I was not looking for clothing this past weekend, or jewelry a few weeks ago, but they just fell in my lap. I think God just appreciates my appreciation for good deals and pretty clothes, and He helps me maximize my limited budget. I don’t know if that’s theologically sound, but I believe it. Do you have something similar – a special, unimportant thing that you know is a gift from God? Maybe it’s not finding good clothing deals, but perhaps you always find the best burger in any place you travel. Maybe you’re super into cars, and seemingly every time you look out your window, you catch a glimpse of an expensive car. Maybe cardinals cross your path on a daily basis, or you see a friend in every restaurant you frequent. I challenge you to look for the special blessings in your life that show that God sees you and cares about the things you care about. And if you’re willing to share, I’d love to hear!